What ultimately foiled Big Anthony in Tomie di Paola’s classic Caldecott Honor book Strega Nona was his failure to notice the story’s benevolent witch blowing three kisses after a magical recitation aimed at ceasing the production of pasta in her magic pot. The same basic measure of smug overconfidence initially impedes a determined young girl aiming to solve the “forms” in martial arts without the vital tutelage of an experienced teacher. Unlike the inveterate boaster in the medieval story set in Italy, a young girl stays the proverbial course in a contemporary setting, where mastery follows a baptism under fire. 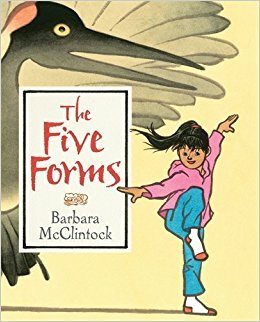 The unidentified central protagonist in Barbara McClintock’s exquisite The Five Forms needs to thoroughly experience the power of mystical forces before committed will power can harness and humanize undisciplined temperament in achieving consummate success in the martial arts.